Do you like the look of bifolding doors? Want to install them within your home? Bifolding doors are favoured by commercial and residential property owners alike due to their many features and benefits. The following is a guide on the features and benefits of bi-folding doors that you can experience when installing them into your property. Wow Factor – Bi-folding doors can generate the wow factor within any home. They don’t just look great but can also provide a 90% clear opening to allow more sunlight and air circulation. Bi-folds can easily increase the sociability between the indoor and the outdoor areas and can offer optimal security for any home. Functionality – Bi-fold doors offer great functionality and operation due to their track mounted design. They allow for easy folding and stacking of the panels for easy opening and closing. They can be installed at floor level to remove any tripping hazard, and can be installed with finger safe gaskets so they are safe for the smaller members of the family. Versatility – Although some may believe that bi-folding doors are only for large homes, this isn’t true. In retrospect, bi-folding doors are suitable for all sizes of homes due to their incredible versatility. Bi-folding doors can fit seamlessly within any home and offer a traditional yet modern look that can complement the surrounding furniture. Material – Bifolding doors are available in a number of material options to choose from including aluminium, glass and wood to name a few. Aluminium bi-folding doors tend to offer more strength while full glass doors can promote more visibility from the inside to the outside. The type of material that you choose for your home will greatly depend on your personal preference and whether they will be exposed to constant weather changes. Finish and Colour – Bi-folding doors are also available in a number of colour options to choose from depending on the supplier you get them from. Powder coating offers a vibrant and durable finish that is great for matching in well with any home. Choose a colour which bests represents you and your home. Cost – The cost of a bi-folding door tends to be less expensive than other types of doors depending on the size needed and what they’re made from. 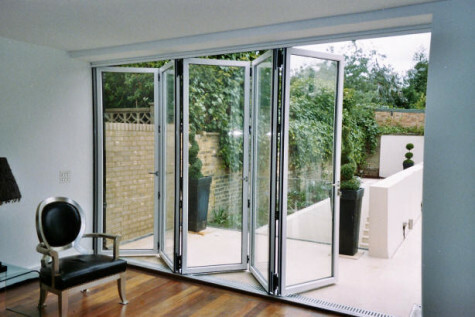 Larger aluminium bi-folding doors may be more expensive than just plain glass. It’s best to consult with your local bifolding door supplier to see what’s the best option that fits in well with your overall budget. Installing a bi-folding door within your home can be a great choice to add value to your home. By deciding where best to place the door along with taking careful consideration to the type of bi-fold door you choose, you can really compliment your home beautifully for years to come. So have you decided on the type of bi-fold door that’s right for you? What type of bi-folding door did you choose and why do you feel it’s best for your home?